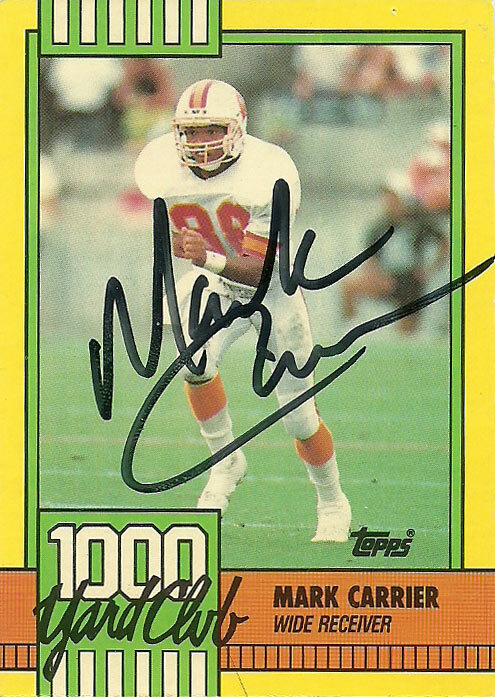 Well 2019 is off to a good start with my first official success in Mark Carrier former Bucs, Browns, and Panthers receiver. Along the way with all three franchises he seemed to leave an indelible and respectable mark on each franchise. It wasn’t until 2018 that wide receiver Mike Evans of the Bucs broke Mark’s single season receiving yardage record for the franchise during the last game of the season. 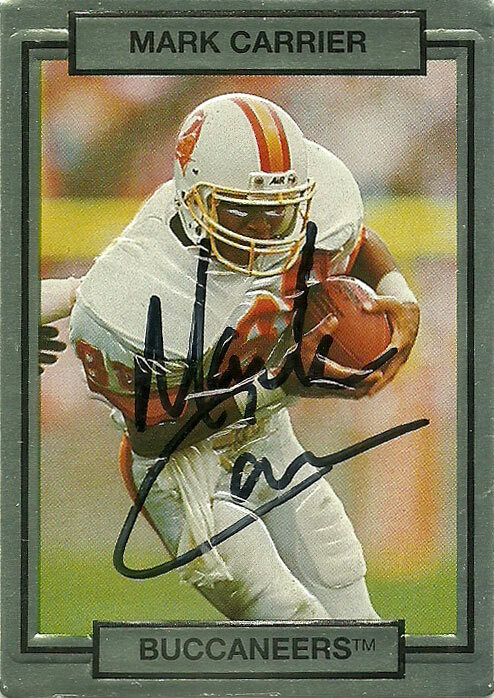 A stellar TTM respondent, Mark signs virtually everything- provided you of course don’t confuse him with the defensive back from the same era. As this is the 10th year I’ve been back at the game, I’ve decided to dust off the books and write some of those players who responded to me over the years. Mark was one of those who responded way, way back in 2011, signing a slew of cards for me. In 2014, Mark announced the Panthers second round pick at the draft. As of this post he is the Director of Player Relations for the team. A player with a stack of amazing cards, I had wanted to reload and get back to Mark again for a few more that I had overlooked. Probably my favorite of this stack is the Upper Deck 1992 Buccaneers Checklist. The artwork is just amazing on this card. They just don’t make them like they used to anymore. The bold outline around the card is just right and frames the image in a very classy way. I especially like how Mark’s profile image and him catching the football take precedence over the buccaneers by simple boldness of color. 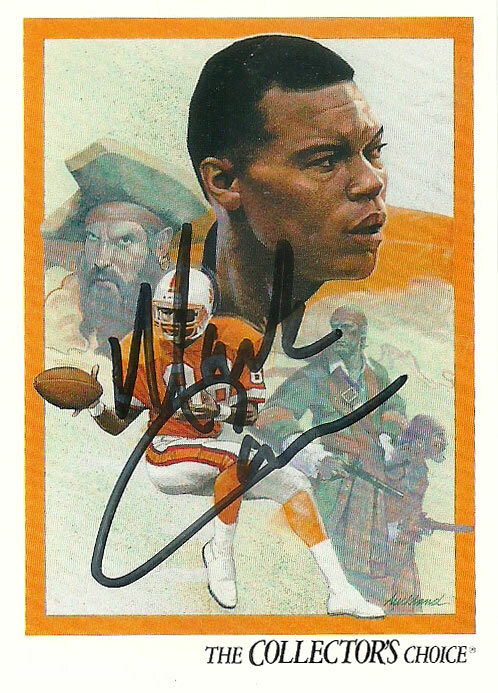 His 1,000 Yard Club card was like most cards from Topps to me at the time- always at least a distant 3rd or 4th in quality or interest to me. While the look is quite dated, that is part of the charm of this card. The boldness of the yellow combined with the orange and green is typical of design from that era. Still it is a great photo of him and at the time it was the only glossy card that was in each pack. As usual during this period for the most part, Action Packed set a high bar for others to follow in terms of photo quality. 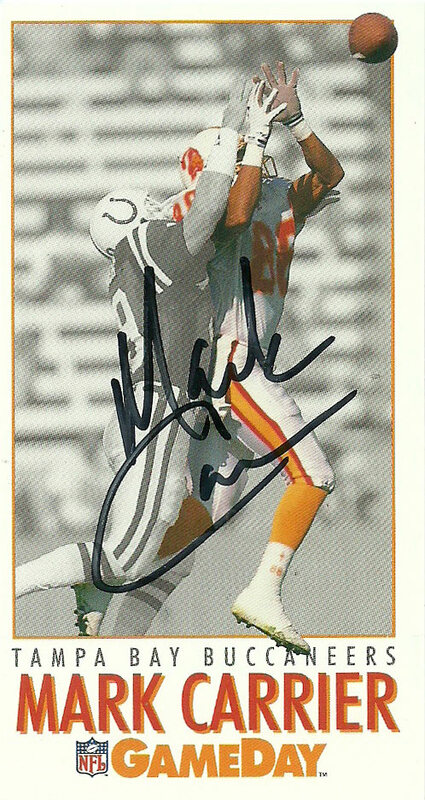 This card was no different, and is an exciting action shot of Mark. Most photos it seemed were also framed from this distance in the set as well in a very comfortable ‘in your face’ distance. I didn’t have this card but when I saw it, I knew it’d look amazing autographed so I picked up one. The GameDay 1992 card feels like the weakest to me of the group. Maybe because it is the only one with a defender in the image, or the fact that the rules of the card are for only the main subject to be in color, take away from the overall shot, but regardless- this was more of a set need than anything else. Mark has a pretty solid autograph all the way around. The looping C in his last name really makes his mark go.